Puli Inji is a very spicy and tangy sidedish for Kootu rice. It can also be mixed with hot steamed rice and ghee or oil. This is my MIL speciality and she taught me. 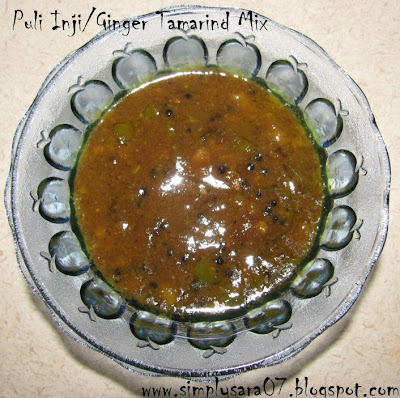 Puli Inji is also one of the dish in Palakad Iyer/Tamil Brahmin wedding menu. Heat a kadai/wok, add oil, add ginger, green chilli and a pinch of salt. Saute till the raw smell goes. Then add tamarind water, turmeric and boil well till the water becomes thick and condense. Finally add jaggery and sesame powder and boil till the jaggery dissolves or its dry. Puli Inji is ready to serve. This can also be sidedish for chapathi. Notes - This can be stored in air tight container for 14-20days in refridgerator. Tangy puli inji looks absolutely yummy..
very authentic n spicy...thanx for sharing..
Sara was just waiting for this post! :-) For us, this recipe would be more like the Mulaga pachadi. 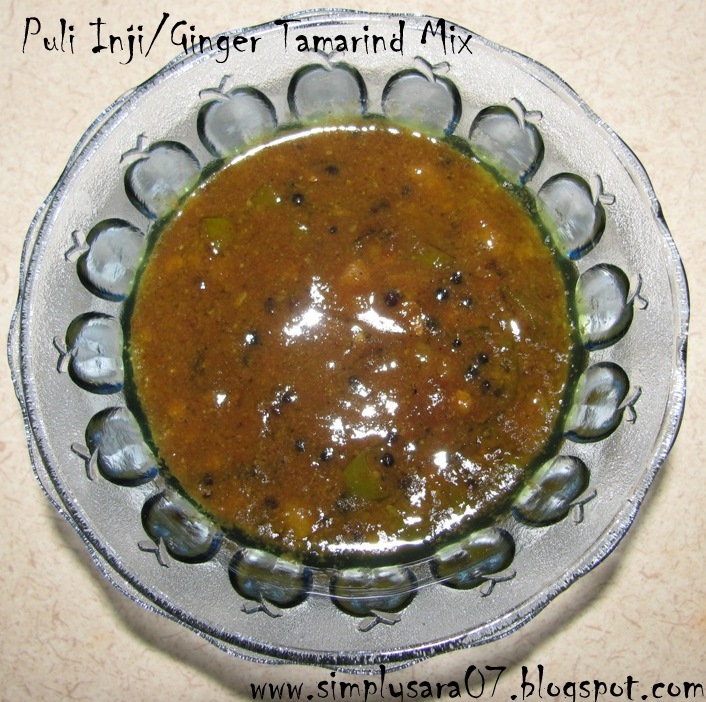 For Puli Inji we use coconut oil and have the option of sauteing the ginger or boiling it. Was just planning to catch up on cooking some of the condiments this weekend. What is going to be you menu for Onam?